The new Macbook Pro's Touch Bar has everyone talking about extra screens, but Razer has decided to turn things up to 11 with a new concept laptop featuring not one, not two, but three full-sized displays built in. It's called Project Valerie, and as the company's reveal at CES 2017 shows, it's absolutely batshit. Each of the laptop's 17.3-inch displays rocks a 4K resolution, which adds up to an outrageous 12K in total -- effectively 12 times the resolution of your 1080p TV at home. The three screens unfold automatically in seconds when the laptop's fired up, and are seamlessly tucked away into the computer's body when it's time to hit the road. Not that you'll be hitting the road too frequently with this baby, as it weighs in at a whopping 12lbs -- that's heavier than the average desktop computer. 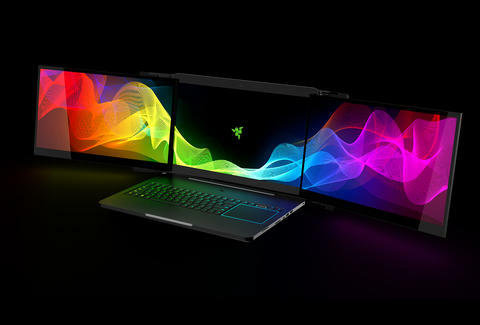 Still, the fact that Razer's managed to cram three damn displays into a laptop that's only 1.5 inches thick is an incredible achievement. The laptop also features a keyboard with Razer's signature Chroma backlighting, as well as immersive lighting underneath each of the displays, and its internal specs are more than capable of handling pro-level gaming, editing, or whatever else you can think of doing with those three screens. Although CES attendees were able to get their hands on a real physical product, Project Valerie's still only a concept device, and as such you probably won't be able to grab one yourself for a while (if at all). Then again, Razer's got a history of bringing insane concept devices to market, so who knows? 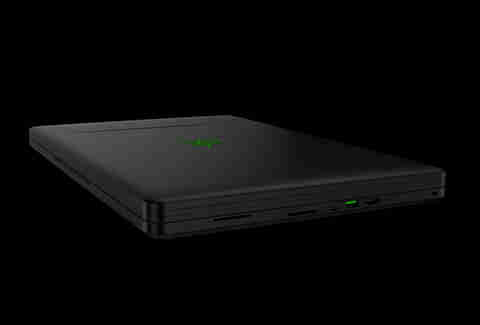 Update 1/9/17: Thieves stole two of the three-screen Razer prototype laptops from the company's CES booth, according to a Facebook post by Razer CEO Min-Liang Tan. "We treat theft/larceny, and if relevant to this case, industrial espionage, very seriously – it is cheating, and cheating doesn’t sit well with us," he wrote. "If you were at the show and/or if you can provide us any information, please do reach out to us at legal@razerzone.com – all information provided will be kept in the strictest of confidence."